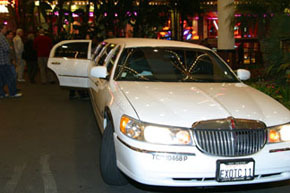 Special guests arrive in style courtesy of Exotic Limousine Service. 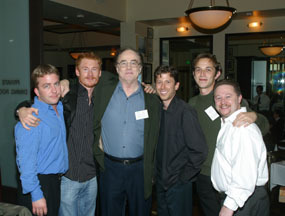 Bob & The Boys: left to right, Peter Billingsley (Ralphie), Zack Ward (Scut Farkus), Director Bob Clark, R.D. Robb (Schwartz), Ian Petrella (Randy), and Scott Schwartz (Flick). 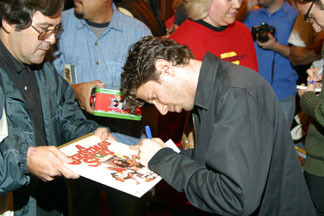 The reunion dinner was held at the Fashion Island Daily Grill Restaurant preceding the screening of A Christmas Story. 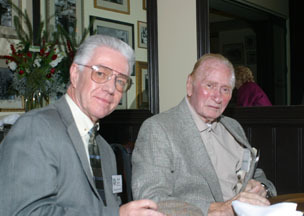 Arnold Kunert, K3 Arts & Entertainment Producer, chats with Darren McGavin (the Old Man - Mr. Parker) at the Daily Grill reunion dinner. 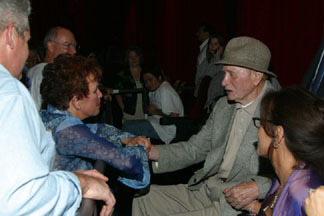 Darren McGavin greets audience well-wishers after receiving a standing ovation during the cast introductions at the Edwards Big Newport Cinema. U. S. Marine Corps contingent collected over 1200 toys for the 2003 Toys For Tots campaign. They joined us, with their families, for the screening. 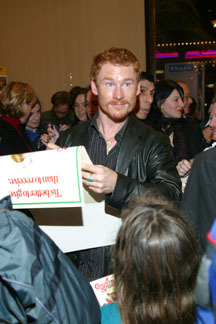 Zack Ward (Scut Farkus, our favorite bully) , autographs A Christmas Story memorabilia before the screening. 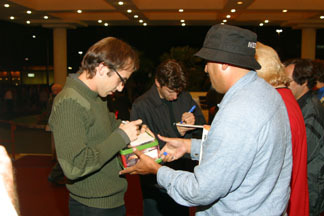 Ian Petrella (left) and Peter Billingsley seated among the 1100 others who were lucky enough to make it into the first screening. 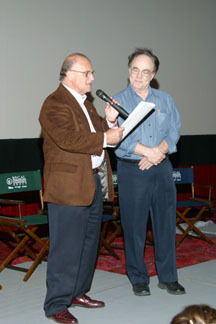 Newport Beach Mayor Steven Bromberg (left) presents Director Bob Clark with a Proclamation declaring November 20, 2003 as A Christmas Story Day in Newport Beach. Scott Schwartz (Flick), with microphone, reveals the secret of the "tongue on the flag pole" during the Q&A at the Big Newport Cinema preceding the screening of A Christmas Story. 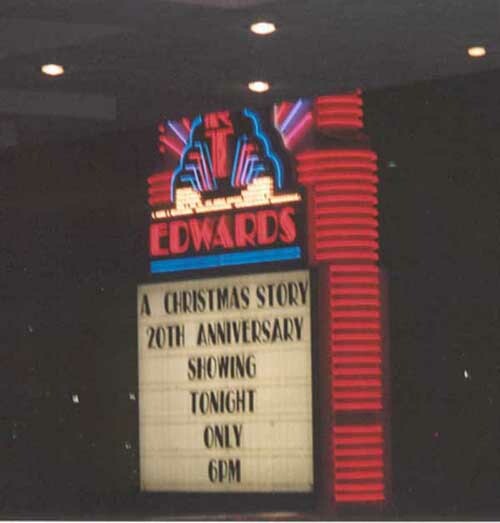 Also pictured are Zack Ward (Scut Farkus), left, and Peter Billingsley (Ralphie), far right.
. . . Photo: Montgomery Photography Several Major Awards (Leg Lamps) were raffled to lucky audience members. Lamps courtesy of One Leg Up, who also provided Lamps for Darren McGavin and Bob Clark, among others.